Veteran night sky photographer Ajay Talwar of the astrophotography group The World at Night took this photo of the moon and planet Venus rising over the River Ganges in Uttarakhand, India in October 2012. This stunning photo sequence shows the crescent moon and planet Venus rising over India’s Ganges River. Veteran astrophotographer Ajay Talwar of the photography group The World at Night captured this image from Uttarakhand, India in October 2012. 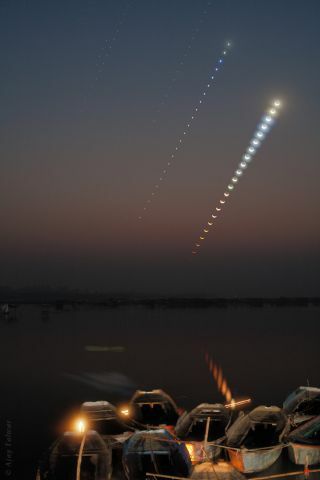 The sequence illustrates the path of the two celestial objects every few minutes over the sacred river. The Ganges is the national river of India and many regard its waters as deeply spiritual. Editor's note: If you have an amazing skywatching photo you'd like to share for a possible story or image gallery, please send images and comments, including name and location to spacephotos@space.com.